Set in the winter of 1147, the second book in The Queen’s Guard series follows Lady Catherine le Rochefort, who was welcomed into the ranks of Queen Eleanor’s guard after escaping a deadly encounter. The French army makes its way through Asia Minor, with King Louis determined to recapture Edessa, a holy undertaking blessed by the Pope. After leaving Constantinople, Queen Eleanor waits with her guard and retinue in Nicea for King Louis to decide which route the caravan should take toward Antioch and her uncle Raymond’s palace. 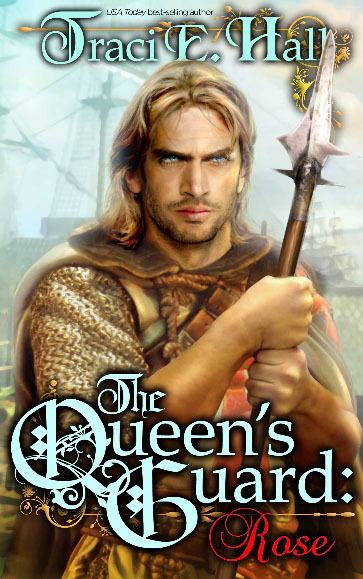 Eleanor caused trouble in Constantinople, so Louis asks his trusted friend Lord Payen de Montfer to infiltrate the guard and listen for dissent. Payen, whose painful past has taught him that beauty makes a man weak, does his best to ignore the fair Catherine, while Catherine tries to protect her deadly secret from the observant man. Catherine seeks only to reach Jerusalem, where absolution awaits, but soon she’s fighting her feelings for Payen. If the two give in to their attraction, Payen’s honor is at stake and Catherine fears she could lose her soul. Mamille of Rou, alias Rose, is one of three elite female bodyguards remaining to protect Queen Eleanor of France. The unusual guard began the holy pilgrimage from France to seize the important city of Edessa from infidels. Along the way, Mamille has been unable to quell her attraction to the strong and handsome Dominus Brochard, a Knight Templar who has travelled with Eleanor’s guard since the very beginning. But unbeknownst to Mamille, Dominus has been working undercover on behalf of the bishop of Clairvaux, ensuring Eleanor’s husband, King Louis, is protected from certain political advisors with nefarious aims. Mamille thinks Dominus is way too virile to be chaste, though she honors his decision. Dominus thinks she is way too beautiful to sleep alone, and his frustration lies in being unable to claim her for himself. Instead, he watches over her from afar and takes his jealousy out on the enemy Turks. But there is someone else watching both of them. Someone with enough power and influence to tear the king and queen apart and wrest Mamille and Dominus away from each other forever.